Featured in Unique Cars #388 – this eight-year resto came up a treat! 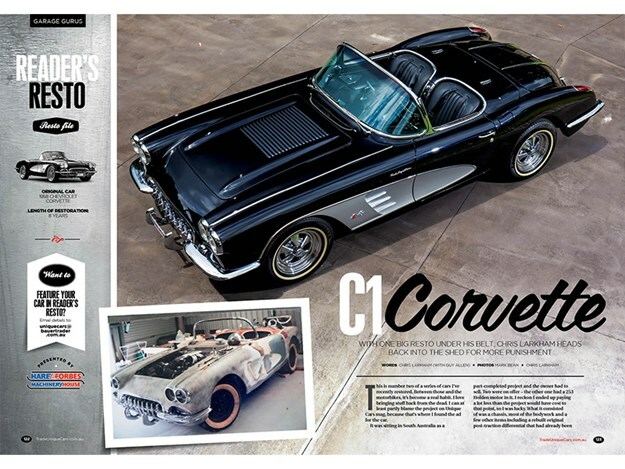 Featured as our Reader’s Resto for Unique Cars #388, this 1958 C1 Corvette has had the proverbial kitchen sink thrown at it – by the hands of a dedicated owner who patiently undertook the eight-year resto. It’s almost full-circle as owner Chris originally bought the C1 from our classifieds! Chris bought the car out of South Australia as a partly completed project. It had already undergone most of the bodywork and the original posi-traction rear end had already been rebuilt and poweder-coated. With no engine or gearbox, Chris opted for a 305 V8 mated to a T5 five-speed manual. The driveline needed custom mounts for the gearbox and a shortening of the tailshaft. Most of the nitty-gritty however went into the interior. The car got a full retrim, and a custom harness set-up. Underpinning the car, was all new suspension and a disc brake front end conversion with adjustable brake bias. 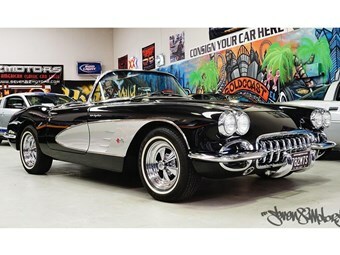 Chris said of the resto: "As much as possible I did this car myself in the shed. I’m a toolmaker by trade – which teaches you patience – and I’ve never felt the need to rush a restoration. This one took near enough to eight years!" The C1 is a top-to-bottom build that straddles the line between a full on resto and a very subtle but useable restomod. The car is currently on offer via Seven 82 Motors in Queensland, and is listed for $130,000.